Background: Newer treatment modalities require subtyping of non-small cell lung carcinomas (NSCLC). Morphological differentiation is often difficult and various immunohistochemical (IHC) panels have been used to maximize the proportion of accurately subtyped NSCLC. Aim: The aim of this study was to subtype NSCLC on fine needle aspirates (FNA) using a minimal antibody panel. 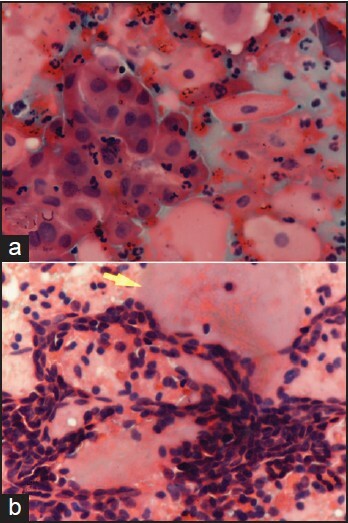 Materials and Methods: Cell blocks from 23 FNA samples with a morphological diagnosis of NSCLC were taken. IHC was evaluated (blinded to clinical data) for thyroid transcription factor-1 (TTF-1), cytokeratin (CK)7, CK20, and tumor protein p63. Results: TTF-1 was positive in 14 and negative in 9 cases. The p63 was positive in two cases each of TTF-1 positive and negative tumors. CK7 was positive in 12 of the 14 TTF-1 positive tumors and 4 of the TTF-1 negative tumors. CK20 was negative in all. All the 14 TTF-1 positive tumors were primary lung tumors, 12 being NSCLC and 2 being squamous cell carcinoma. Five of nine TTF-1 negative tumors were metastatic tumors from endometrium, kidney, and head and neck region (two), and one was an unknown primary. Four of the nine TTF-1 negative tumors were morphologically NSCLC and were clinically considered to be primary lung tumors. Three of these tumors stained positive for CK7 but negative for CK20 and p63, and one case was negative for the immunomarkers. Conclusion: Use of limited IHC panel helps categorize primary versus secondary tumors to the lung. The p63 is a useful marker for detecting squamous cell carcinoma. In countries where antibodies are not readily available, using a limited IHC panel of TTF-1, p63, and CK7 can help further type NSCLC lung tumors. Background: Low-grade squamous intraepithelial lesions (LSIL) are the earliest lesions of the uterine cervix, the persistence and integration of high-risk human papillomavirus (HR-HPV) as type 16, which promotes the development of more aggressive lesions. Aim: To select more aggressive lesions with tendency to progress to invasive cervical cancer. 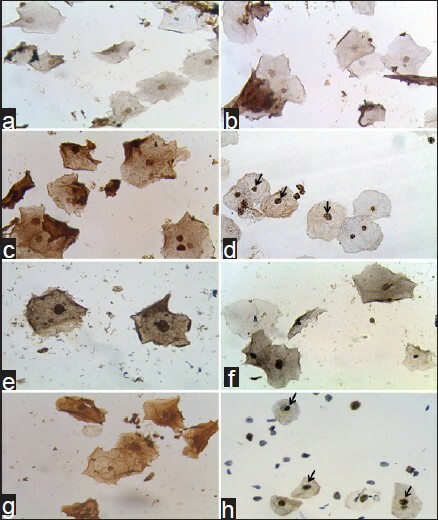 Materials and Methods: A total of 75 cytological specimens in liquid base (Liqui-PREP) were analyzed: 25 specimens were with no signs of SIL (NSIL) and without HPV; 25 NSIL with HPV-16, and 25 with both LSIL and HPV-16. The expression of Ki-67, telomerase, and viral E6 was evaluated by immunocytochemistry; and the detection of viral DNA was done by polymerase chain reaction (PCR) and restriction fragment length polymorphism (RFLPs) for genotyping or sequencing of HPV-16. The physical state of HPV-16 was evaluated by in situ hybridization with amplification with tyramide. Results: Of the total group, 58.6% had LSIL associated with persistence and of these 59.3% was associated with integrated state of HPV as intense expression of E6, Ki-67 (P = 0.013, P = 0.055) has except for the expression of telomerase present a non-significant association (P<0.341). Conclusions: Overexpression of E6 and Ki-67 is associated with the integration of HPV-16, favoring viral persistence, and increasing the risk of progression in women with NSIL and LSIL. Background: The incidence of breast carcinoma is increasing in developing countries due to adoption of western life-style. 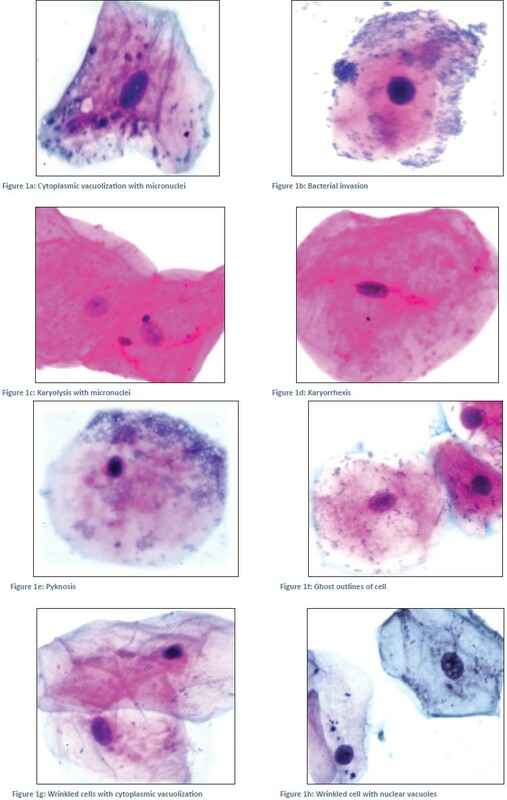 Fine-needle aspiration cytology is the initial method to evaluate the palpable breast lesions. The neoadjuvant therapy is helpful in treating high grade rather than low grade breast carcinomas. Masood cytologic index (MCI) delineates all the breast lesions into four groups. The carcinoma group is not graded further. Aim: The present study proposes a method for the expansion of carcinoma group into three grades. Materials and Methods: A total of 50 breast carcinoma cases were prospectively studied by comparing expansion of MCI with modified bloom Richardson (MBR) grading over a period of 3 years. Results: Altogether 43/50 cases (86%) had concordance with histopathological grading. The analysis revealed a R2 value of 60%, which was significant. The P value of anisonucleosis, nucleoli and chromatin pattern were 0.001, 0.049 and 0.02 respectively, which were significant. Conclusions: The present study with the expansion of carcinoma category of MCI into three grades similar to MBR will help the treating surgeon to plan the management accordingly. The results obtained in this study need to be subjected to multicentric study with a large number of cases. Background: Pure neuritic leprosy (PNL) usually presents with neurological symptoms without skin involvement. Fine needle aspiration can play an important role in the management of PNL cases presenting as nerve abscesses. Aim: To assess the role of fine needle aspiration cytology (FNAC) in diagnosing and categorizing PNL cases presenting as nerve abscesses in the absence of neurological symptoms. Materials and Methods: Five patients with subcutaneous nerve related swellings without clinically evident neurological deficits were subjected to FNAC. 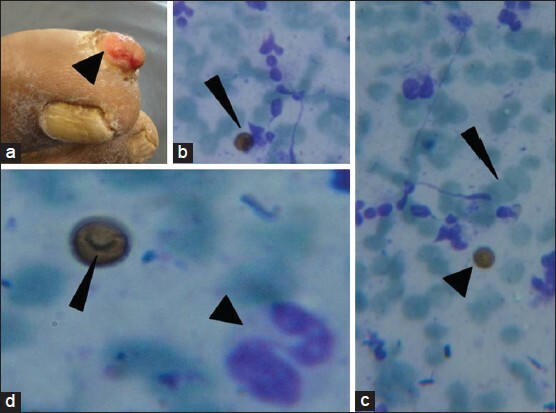 As the cytological features were suggestive of nerve abscesses due to leprosy, Fite stain was performed in all cases. As none of the patients had any leprosy skin lesions, they were diagnosed as cases of PNL. Features like cellularity, caseous necrosis, presence or absence of lymphocytes, macrophages, epithelioid cells, granulomas, Langhans giant cells and nerve elements were analyzed with the bacteriological index, to categorize PNL according to the Ridley-Jopling classification. 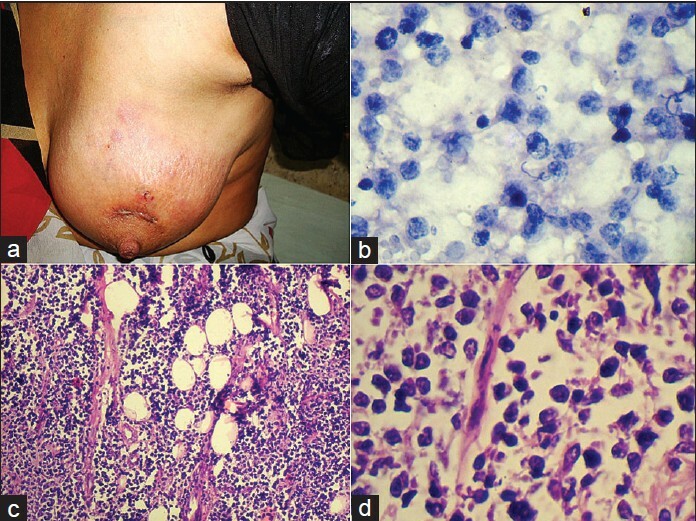 Results: Based on the cytological features and bacteriological indices, 3 cases were cytologically categorized into tuberculoid (TT)/borderline tuberculoid (BT) leprosy and the other two, as BT/borderline lepromatous (BL) and BL leprosy respectively in spite of having similar clinical presentation. Based on the cytological diagnoses, category-specific treatment could be instituted with clinical improvement. Conclusions: The simple and minimally invasive FNAC procedure allows diagnosis and a reasonably accurate categorization of PNL presenting as nerve abscess and therefore, highly useful in its clinical management. Background: Cytological artifacts are important to learn because an error in routine laboratory practice can bring out an erroneous result. Aims: The aim of this study was to analyze the effects of delayed fixation and morphological discrepancies created by deliberate addition of extraneous factors on the interpretation and/or diagnosis of an oral cytosmear. 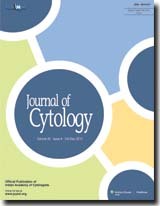 Materials and Methods: A prospective study was carried out using papanicolaou and hematoxylin and eosin-stained oral smears, 6 each from 66 volunteer dental students with deliberate variation in fixation delay timings, with and without changes in temperature, undue pressure while smear making and intentional addition of contaminants. The fixation delay at room temperature was carried out at an interval of every 30 minutes, 1 day and 1 week and was continued till the end of 1 day, 1 week, and 1 month, respectively. The temperature variations included 60 to 70°C and 3 to 4°C. Results: Light microscopically, the effect of delayed fixation at room temperature appeared first on cytoplasm followed by nucleus within the first 2 hours and on the 4 th day, respectively, till complete cytoplasmic degeneration on the 23 rd day. However, delayed fixation at variable temperature brought faster degenerative changes at higher temperature than lower temperature. Effect of extraneous factors revealed some interesting facts. Conclusions: In order to justify a cytosmear interpretation, a cytologist must be well acquainted with delayed fixation-induced cellular changes and microscopic appearances of common contaminants so as to implicate better prognosis and therapy. 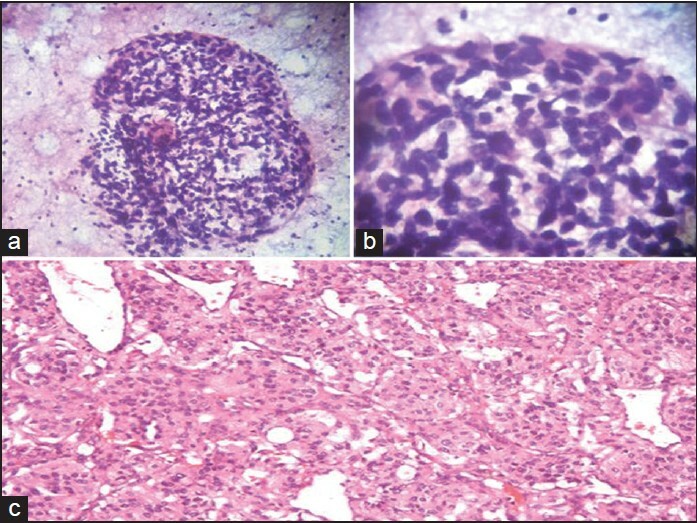 Background: Cytological reports of ameloblastoma are relatively rare in the literature. 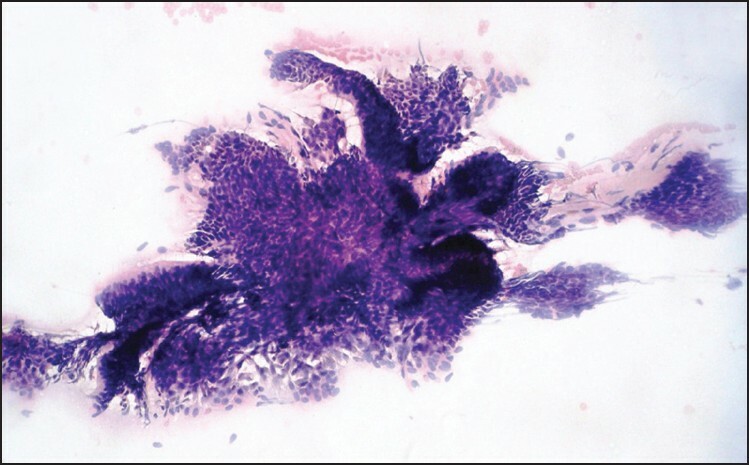 Appropriate cytologic diagnosis may play a significant role in its preoperative presumptive diagnosis, especially when incisional biopsy findings are inadequate. Aim: To systematically study the detailed cytomorphologic features of ameloblastoma and to evaluate the role of fine needle aspiration cytology (FNAC) in its preoperative diagnosis. 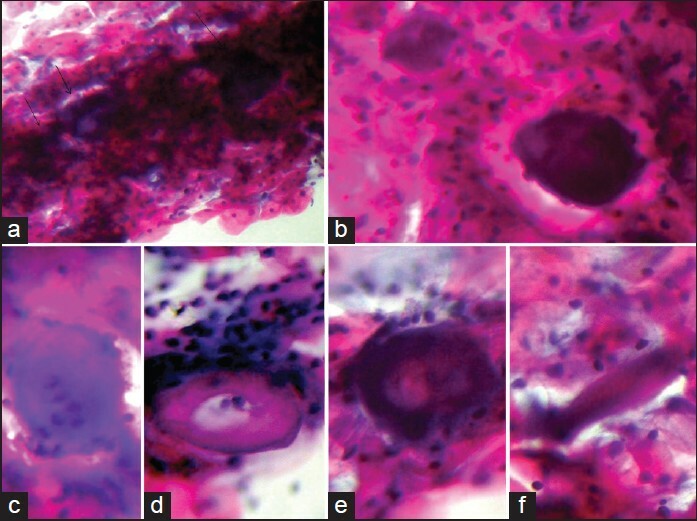 Materials and Methods: In this study, FNAC was done on 26 cases of intra-osseous jaw lesion, clinically diagnosed as odontogenic tumor or developmental odontogenic cysts and detailed cytopathological interpretation was carried out and the results were correlated with the corresponding histopathology. Results: Of the 26 cases, 15 were found to be ameloblastoma and sensitivity of FNAC in the diagnosis of ameloblastoma was found to be 86.6%. None of the intra-osseous jaw lesion was false positively diagnosed as ameloblastoma in FNAC and hence the specificity was found to be 100%. Conclusion: Presence of cohesive epithelial cell clusters exhibiting smaller basaloid cells with peripherally placed tall columnar cells and occasional large squamous cells either adjoining the basaloid epithelial clusters or in isolated group aids in the specific cytological diagnosis of ameloblastoma and FNAC offers an excellent diagnostic aid that may play a significant role in preoperative presumptive diagnosis of ameloblastoma along with incisional biopsy. Aims: The present study was undertaken as a baseline study to evaluate the nuclear diameter (ND), cell diameter (CD) and nuclear-cytoplasmic ratio (N:C) and their variation with age in normal buccal smears of female subjects. Materials and Methods: Buccal smears were collected from 400 apparently healthy individuals. After fixation in 95% alcohol, the smears were stained using the standard Papanicolaou laboratory procedure. The CD and ND were measured using a stage micrometer and an ocular micrometer. Statistical analysis of the data was performed using the one-way analysis of variance to evaluate the difference in the ND, CD and N:C with age in females. Multiple range tests by Tukey-honestly significant difference procedure were performed to evaluate the significance between various age groups. Results: The results showed an increase in ND and CD from the 5-10 age groups to 15-35 age groups. In the 15-35 age groups, there was a decline in ND and CD when comparing the first and the second half of the menstrual cycle, but the difference was not significant. There was further decline in ND and CD in the 45-60 age groups. Variations were also seen in ratio N: C. Pattern of exfoliation also varied in each age group. Conclusion: Age-related alterations are observed in buccal smears. Introduction: Cervical intraepithelial neoplasia and cervical cancer remain important health problems. 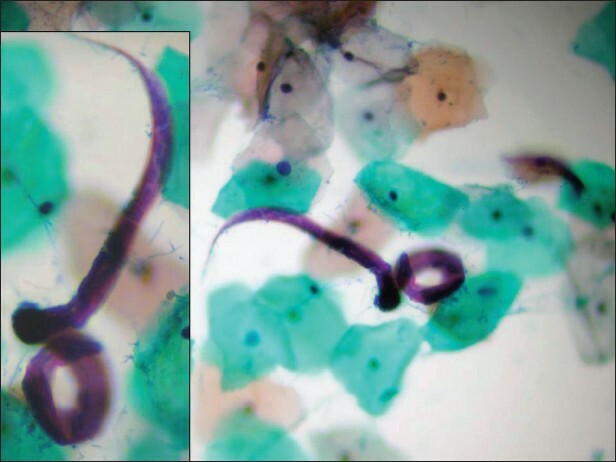 Cervical cytology by Papanicolaou (Pap) smears is an effective means of screening for cervical premalignant and malignant conditions. Aim: The aim of this study was to assess the prevalence of cervical dysplasia in pre- and postmenopausal women in western Uttar Pradesh and to find out risk factors as far as possible. Materials and Methods: A total of 4,703 cases were enrolled, cervical scrape smears were collected and stained using Papanicolaou's method and hematoxylin and eosin stain. The emphasis was put on epithelial abnormalities and smears were classified according to The Bethesda System 2001. Results: 81.06% (3812) smears were satisfactory according to The Bethesda System. Maximum numbers of cases (40.37%) were in age group 30-39 years. The epithelial abnormalities constituted 3.23% of all cases. Low-grade squamous intraepithelial lesion (LSIL) formed the largest number (1.36%), while high-grade squamous intraepithelial lesion (HSIL) formed 0.91%. Eleven cases of squamous cell carcinoma (SCC) were detected. The study has shown a relatively high prevalence of epithelial abnormalities in cervical smears with increasing age, parity, early age at first coitus (<20 year), and lower socioeconomic status in symptomatic women with clinical lesions on per speculum examination. Conclusion: Epithelial abnormalities of cervix are not uncommon in our setup and are associated with early age at marriage and parity. Aim: The primary goal of our study was to evaluate the value and accuracy of fine needle aspiration cytology (FNAC) in the diagnosis of various intraoral lesions and to correlate the cytological diagnosis with final histopathological findings. Materials and Methods: Fine needle aspiration was performed in 229 patients presented with different lesions of the oral cavity at our institution. 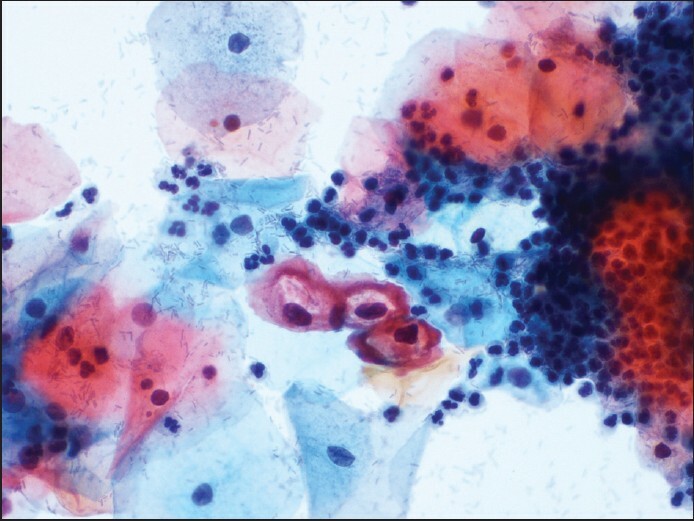 Cytological findings were then compared with final histopathological diagnosis. Results: With a male to female ratio of 1.79:1, 229 patients presented with different lesions of the oral cavity were aspirated. Histopathological correlation was available in 86.9% of cases while inadequate material was obtained in 13.1% cases. The diagnostic accuracy of fine needle aspiration in diagnosing benign, pre-malignant and malignant lesions were 95.8%, 84.6% and 97% respectively. Overall the diagnostic accuracy of FNAC in diagnosing intraoral lesions was 94.9% with sensitivity and specificity of 93.2% and 96.8% respectively. Conclusion: FNAC of intraoral lesion is recommended as a valuable procedure for the initial evaluation of all intraoral lesions as it is simple, inexpensive, convenient and comfortable to the patient. Moreover, it can offer a rapid and accurate diagnosis for further management of the patient. 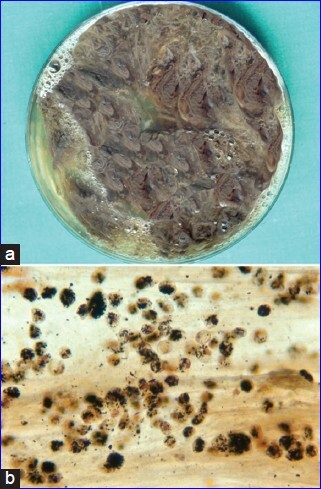 Black-pigmented sputum, also called "melanoptysis," is a symptom that may be observed in certain pathologies such us coal workers' pneumoconiosis (anthracosis). The cavitation and liquefaction of a fibrosed mass by an infectious process (tuberculosis, infections by anaerobes, etc.) or by ischemic necrosis may cause expectoration of a blackish secretion. We report the case of a patient with labor precedents as a coal worker, from whom abundant black sputum was obtained in the course of an incidental expectoration. 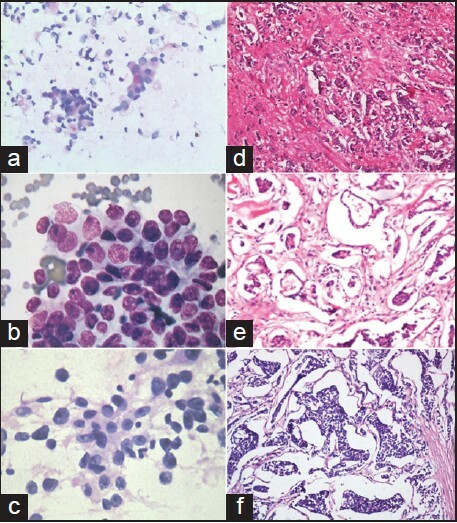 Cyto-histological findings are shown and a differential diagnosis is established. Paragangliomas are uncommon tumors arising in paraganglion tissue, which is well represented in the head and neck. A correct pre-operative cytological diagnosis helps in planning early and optimal surgery. Cytologic features in carotid body tumor and extra adrenal paragangliomas have been well described and documented. In addition to the acinar and discrete arrangement of cells, smears also showed a few large loose clusters of cells enveloped by thin vascular channels-the so-called zellballen pattern, a diagnostic feature on histopathology. Zellballen pattern of paraganglioma on cytology is not a common finding and hence is being reported. Scar endometriosis can be a diagnostic challenge in fine-needle aspiration cytology (FNAC) smears that at times, is the first diagnostic modality in such cases. The challenge is amplified when the clinical details are limited and cytopathological features reveal nuclear atypia. 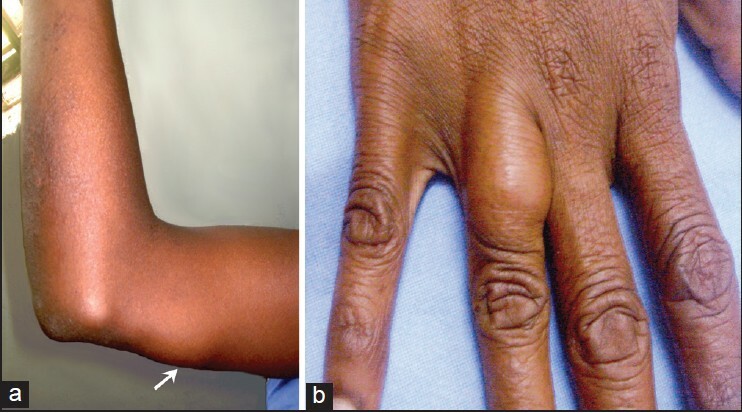 A 33-year-old lady presented with an abdominal swelling that she noticed after she met with a scald. Clinically, the swelling was located lateral to her 3-year-old pfannenstiel incision scar. The initial diagnosis on FNAC was metastatic adenocarcinoma. On review, smears were hypercellular, comprising epithelial cells in groups and focally, regular glandular arrangements, imperceptibly admixed with numerous, relatively smaller, short spindly cells. Epithelial cells exhibited mild to focally, moderate nuclear enlargement/atypia. Subsequent biopsy and excision revealed endometrial glands exhibiting focal nuclear atypia with adjacent stroma. Diagnosis of endometriosis was offered. The results were reinforced with positive estrogen receptor staining in the glands and stroma, along with CD10 positivity in the stroma. The patient was recommended gonadotropin releasing hormone analogs and is presently free of disease a year after her diagnosis. FNAC can be a pitfall in the diagnosis of endometriosis. Correct diagnosis has significant therapeutic implications. Although presence of atypia in such cases should not delude the diagnosing cytopathologist for consideration of endometriosis, it should be documented. The value of clinical history in such cases cannot be overemphasized. Primary breast lymphoma (PBL) is a rare entity. It represents 0.4% of malignant breast lesions and 2% of extranodal lymphomas. 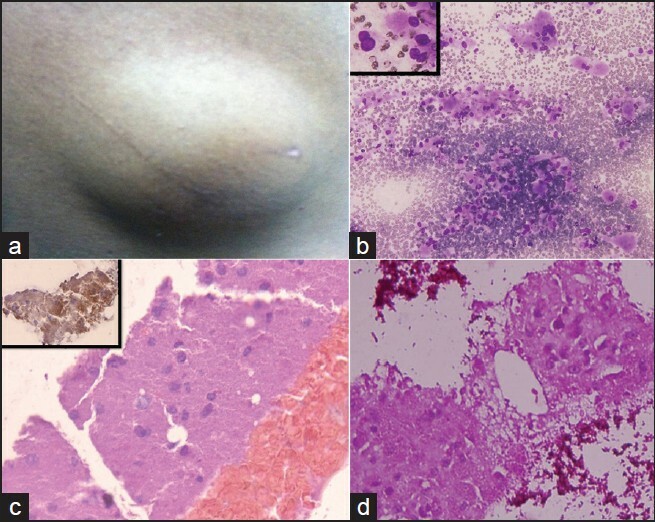 A 23-year-old woman presented with a left breast lump followed by palpable left axillary lymphadenopathy. 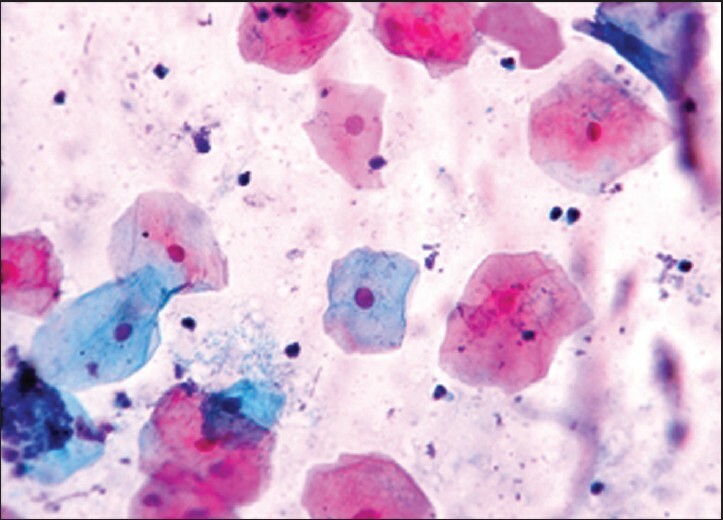 Fine-needle aspiration cytology (FNAC) and histopathology were diagnostic of non-Hodgkin lymphoma-large cell type. Immunohistochemistry was positive against leukocyte common antigen and CD20. 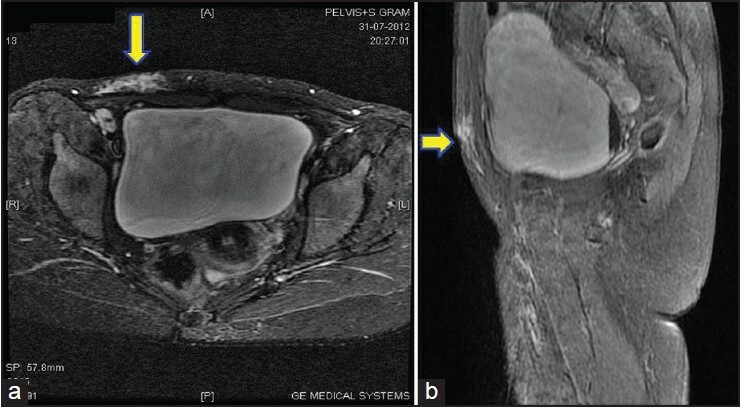 Because PBLs are uncommon malignant lesions and they usually do not have characteristic clinical and imaging findings, FNAC may prove to be a simple, rapid, reliable, and cost-effective procedure for successful diagnosis of the PBL. Granular cell tumors (GCT) are uncommon tumors of uncertain histogenesis. They may occur at any site and most commonly involve the tongue, breast, upper respiratory tract, and soft tissue of upper extremities; however, the involvement of skin is rare. The cytological findings of cutaneous GCT are limited to a few cases being reported till date; we report a case of cutaneous granular cell tumor in a 42-year-old male.